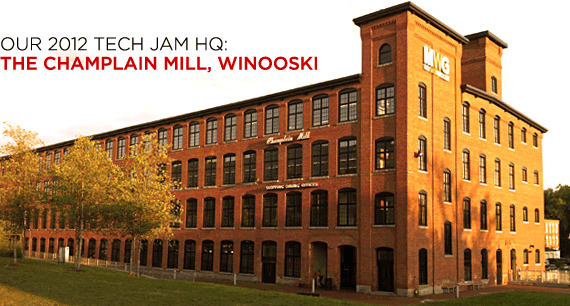 This year's Tech Jam will be held in the Champlain Mill in Winooski. The building is a former textile mill that was transformed into a mall, and has recently undergone another overhaul: Online grocery leader MyWebGrocer bought the building in 2011 and moved its operations to the top floor. There are several other tenants in the building, including Marathon Health, Physician's Computer Company, New Breed Marketing (open-house), the Winooski Memorial Library and the Vermont Technology Alliance (open-house), most of whom are taking part in the Tech Jam. Tech Jam exhibitors will set up shop on floors two and three — the ground floor, and the floor above it. We'll be using the hallways as well as some vacant retail space. Walk around, and you'll feel like you're part of a scrappy start-up — a feeling that will be familiar to anyone who attended last year's Tech Jam in the space that had just been vacated by Borders Books & Music! You can't see it from the street, but there is a massive parking garage in the center of Winooski's newly renovated downtown (the building that anchors the west side of the roundabout wraps around it). It's just across the street from the Champlain Mill. 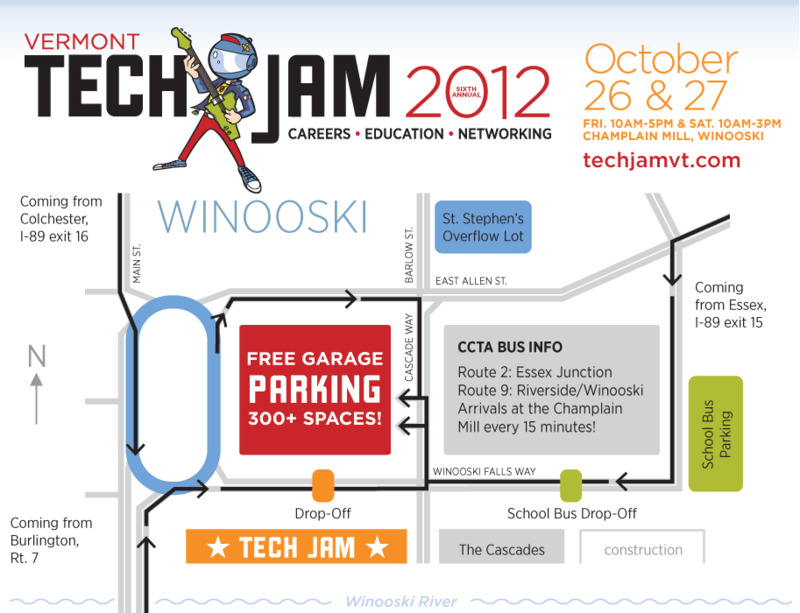 We've been working with the City of Winooski to offer unlimited free parking for the duration of the Tech Jam. We'll have lots of signs, and some helpful guides, to show you how to get into the garage. The entrance is on Cascade Way, which runs between Winooski Falls Way (the street the Mill is on), and East Allen Street (Route 15). If the garage is full when you arrive, please try parking at our overflow lot at St. Stephen's Church on Barlow Street just 2 blocks away. There is also some curb-side parking througout downtown Winooski, but most spots have a two-hour limit. We'll have coffee and snacks inside the Tech Jam — Cupp's Café will be selling coffee and treats on Friday, and the Essex High School Robotics Club will be selling coffee as a fundraiser on Saturday. But plan to eat at least one meal in the 'Noosk. There's a diverse and delicious array of restaurants just steps from the Tech Jam. Many of these restaurants will offer a 15% discount to anyone who attends the Tech Jam. Coming in from out of town? Quality Inn Shelburne (less than 9 miles from the Jam) is offering reduced rates for Jammers: $74.99 per night, plus tax, based on double occupancy (2 adults in room), based on availability. Good for a room with either 2 one king bed, or 2 queen beds. Included is full hot breakfast, indoor heated pool, hot tub, sauna, fitness center and wi-fi throughout. Mention "Tech Jam" when you book: 802-985-8037.